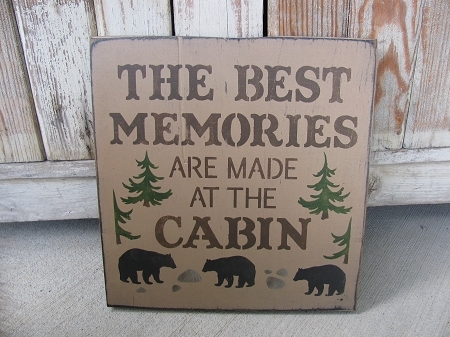 Rustic Primitive Best Memories at the Cabin Hand Painted Wooden Sign. A perfect addition to your cabin or lodge decor. The Best Memories are made at the cabin. Accents of pine trees, rocks and black bears. The background has been painted a khaki tan color and the words are all in a milk chocolate brown color. Hanging options are available. Shown here with a sawtooth hanger. The board is a solid 1" thick pine board, size 12"x12". The edges and the sign are sanded and antiqued for a worn rustic look. The entire sign is then stained, the back is finished as well. A stencil was purchased to complete this project. Hand painted by Heidi.